Spirituality – Why and What ??? The English Dictionary defines the word “spiritual” as “Relating to or affecting the human spirit or soul as opposed to material or physical things”. Now before ‘The Gaudiya Treasures of Bengal’ delves deeper into this topic, it is essential for all of us to understand as to who we actually are? The answer to this question will help us make sense of life, in the first place, and lead us to the gradual understanding of what truly is the goal of it. In other words,the more we discuss and brainstorm upon our own identity, the more clarity it shall provide to logically deduce as to what we are essentially searching for. Are we our Bodies ? For instance, according to one popular school of thought, human beings and in fact all living beings ,are just a lump of flesh and blood.They argue, that our activities of thinking,willing and feeling arise out of complex interactions of matter. However,we are practically yet to conceive a robot in any of our science labs,that successfully demonstrates any symptoms of creativity,inspiration or love – the elementary functions of our conscious selves. So though there is no proof to this theory, it is still nonetheless a theory, and is widely accepted and endorsed by many. It is worthwhile mentioning over here, that a cell, which is the basic constituent of a human body,has a definite life span, and once a particular cell dies, it is replaced by another. In this way, it is believed that over a span of 7 years, all the cells that constitute the physical body of a person, are completely replaced by the new ones. So in effect, a person receives a new body in every 7 years. Now if someone identifies himself with his own body, then he should be considered dead in the next seven years, as he gets physically replaced, or should we say, it is he who is completely replaced.Hence going by this school of thought, a person should be considered a completely different individual, after a span of seven years. And the new individual, seven years older, would be a different person with different sets of qualities, nature, acumen and consciousness who would have nothing to do with the person who he had just replaced. Going further on this, a person shouldn’t be sentenced for any crime, for more than seven years, as it would implicate that a different individual would have to suffer for the misdeeds he has not committed (it was committed by someone he has replaced). Another implication of this philosophy, might be the inclusion of an expiry date of seven years ,to the academic degrees. So Doctors, engineers,singers,etc need to prove their qualification periodically at a gap of seven years, as the new person might not be born as qualified as the person he had just replaced. As strange as these might seem, it is exactly the kind of scenario we would have in our hands, if we were our bodies. I hope after deeply considering the above points, we now realize that we are not just a lump of flesh and blood, that our physical bodies are made up of. Instead, our identity remains elsewhere, far subtler than the gross material covering that encapsulates us. So just to summarize the point that i was trying to drive home – We possess our bodies, that are made up of gross matter, but we are not our bodies. We see through our eyes ; but we are not our eyes. We remain constant, unchanged and living in the midst of the various changes that keep occurring to this material world and the body of matter that we so dearly possess. So, where does our identity actually lie ? Who really are we ? How to explain the consciousness of a person,in certain cases, who is lying unconscious in a state of coma ? How to explain past life memories ? How to explain OBEs (out of body experiences) or NDEs (Near Death experiences).One who’s interested to get a list of these cases, can look up a very well-known book called ‘Into the Unknown’ published by the Reader’s Digest in 1981.So, now if we are ready to look beyond this world of dead matter, let us try to dig in a bit further. The Vedic literatures, which are the oldest man-written scriptures present in this world, gives us some much needed insight on this subject. The Vedic scriptures, composed mainly in sanskrit, and which encompasses a huge volume of texts and manuscripts, provide a detailed analysis and a first hand experience of significant historical events, with a purpose to teach us the science of life. The vedic culture is still prevalent in certain parts of India even today, where the daily lifestyle of people and their values are in harmony with the conclusions of the vedas. The first aphorism of the Vedanta Sutra (that which reveals the method to understand the Vedic knowledge) , states ‘athato brahma jijnasa’ – Now one should inquire about Brahman – The absolute truth, the transcendental, spiritual nature. According to the Vedas, the human life is very precious, for it is in this human birth that one can enquire into the ultimate truth, the reality and purpose of one’s existence.‘The Gaudiya treasures of Bengal’ would like to hence congratulate us because we are interested in investigating the details of such subjects, whose very discussion makes our lives meaningful and worthy. The knowledge enunciated by the vedic scriptures is often referred to as Sanatana Dharma, or eternal truth – that which is universal, non-sectarian, and does not change with the effects of time,place and circumstance. The Vedas teach us, that not only humans but all living beings are essentially spirit souls. 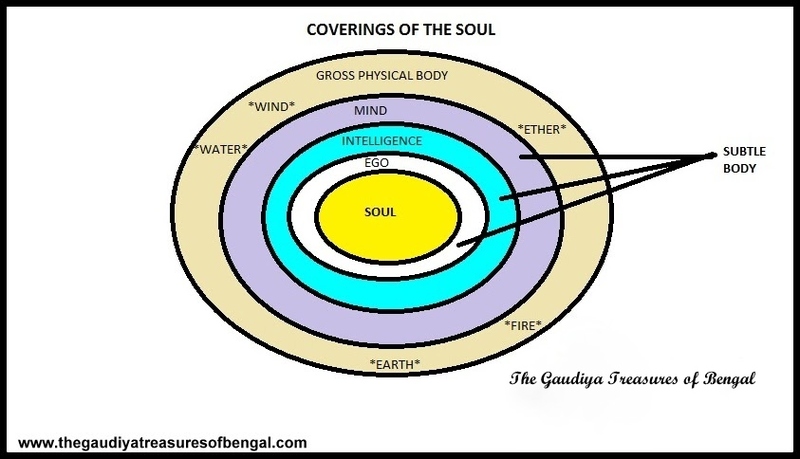 These spiritual entities are entrapped within a body made of gross and subtle matter.The gross covering which constitutes the external physical body,consists of gross material elements like – earth ,water, fire, wind and ether.Underneath this gross body lies a subtle covering comprising of subtle elements – the mind, intelligence and ego with the intelligence being subtler than the mind, and ego being the subtlest. The below picture provides a diagrammatic depiction of the gross and subtle coverings. We all do experience, the interaction of these gross and subtle entities in our day to day life to a certain extent. The senses, made up of the gross elements, help us to interact with the external world. The mind, the storehouse of the thoughts and emotions, directs the action of the senses. The intelligence, being even subtler, can exercise its power of discretion, to control the mind. Whereas the ego, defines our sense of identity, from which stems our intelligence and subsequently its discretionary powers. For example, say, you are playing a soccer match. It is the final match of a prestigious tournament, a match in which your team depends on your skills a lot. Now suppose you face a harsh tackle, and you end up getting injured after which you can hardly walk, anymore. The gross body is clearly not in the best of shapes anymore to continue with the game, but it cannot take the decision on its own. So it looks up to the mind for a direction. The emotional mind understands that you are in a lot of pain and so decides to quit the game. But then your intelligence steps in.It logically proves to your mind, that if you quit at this stage, the team will practically be helpless. And it is afterall the final match of the tournament, and only a few more minutes are left to play. So it is wise to continue playing with the injury ,as with you on the field, the team has a better chance of winning. Similar interactions occur with students before their exams. The mind gets tired of studying for long hours and almost always wants to take a break and enjoy – may be by watching Tv or some movies. But, good students, having strong intelligence control the demands of their minds, and continue studying, keeping in view the bigger picture. Hence we find, that the subtler the element the stronger it is; the greater is its power to control. Thus intelligence is stronger than the mind, which in turn is stronger than the senses. The ego comes into the picture, giving us the identity of who we think we are. It is the subtlest layer of the subtle covering and is the key factor which determines the kind of logic the Intelligence applies and the decisions it subsequently takes. For example, if a person considers, life to be nothing but a combination of chemicals (dead matter), then he might not hesitate to cheat or even kill, a fellow human being for his own selfish interests – for there is no harm in this (as per his logic), as the other person he is cheating/murdering is also just a lump of chemicals.He might as well conclude that his actions are no different to just another chemical reaction. A selfish person, who considers material consumption to be the ultimate goal of life , might disregard the interests of others, or their well-being while conducting his own business. On the other hand, a soldier, who considers his duty above all else, might quite readily agree to sacrifice his own life, for the protection of his countrymen. So it all depends on how we actually visualize ourselves, to be who we are, and this is what which constitutes our ego. So we see, that though we can sometimes practically experience and feel the presence of our body,mind,intelligence and ego, we are hardly aware of our spiritual identity. According to the vedas, the real goal of life, is to realize that we are neither our body, mind,intelligence nor should we identify ourselves with any false ego. Instead, we have to understand that we are actually spirit souls and have nothing to do with this temporary,ever changing world of matter which is characterised by birth,disease, old age and death.The soul is eternal, and ever existing. The soul can neither be cut with a sword, nor moistened with water or be burnt with fire.At the time of death, just as a person puts on new garments, giving up old ones, similarly, the soul accepts new material bodies, giving up the old and useless ones.The objective of our lives should be to align our ego (true ego) to our spiritual identity and utilize the body,mind and intelligence to focus upon and nourish our actual needs (the needs of the soul). We need to understand, that though polishing the cage is important,feeding the bird kept inside the cage is of utmost priority. We need to realize that though the brand of the car is important, but it is worth its value only if it serves me in reaching my destination in time. Similarly, the body,mind and intellect is important as long it serves in fulfilling the desires of the soul. Such a harmonized body, mind or intelligence is the greatest boon one can possess. Instead, if they only serve to distract me from achieving my spiritual ends, they can become the greatest curse. The overall objective is to align and harmonize the functionings of the gross and subtle body, with spiritual realities. If one studies the Vedic science deeply, one comes to realize the real cravings of the soul. The soul craves for one thing, and one thing only – love. The soul is always searching to re-establish the loving relationship it once possessed with God, who is the Supersoul. And the role of spirituality is to revive, this deep dormant relationship between the soul and the supersoul. This process of uniting the soul and the supersoul is also known as Yoga. If we study the world around us deeply, we would not find anyone who is not serving someone else. The father serves the son, the son serves his father,the wife serves his husband, the doctor serves his patients, the king serves his subjects, and so on. If someone has no one to serve, then he/she keeps a pet in his/her house and serves him. Thus ,all of us are bound to serve, because by nature, the soul is a servant of the Lord, and service is a natural characteristic of the soul. The service attitude that the soul possesses towards the supersoul, is not based on any obligation, but is instead built on a foundation of a loving relationship. But the living entities, due to the intoxicating influence of the grandeur of matter, are forgetful of their original spiritual identities. And due to a lack of awareness, they generally end up identifying themselves with either one of the gross or subtle material coverings, that leads to a puffed up false ego. Such a misguided person, then attempts to rediscover the loving relationship it once possessed with the Supreme Lord, within the purview of matter, and thus gets entangled with material possessions. But in the process, neither he gets satisfied, nor the person/s he is serving gets fully satisfied- due to the misdirected nature of such service, which should be directed towards the Supreme Lord instead. The relationships that we have with each other in this world should be thus based on appreciating our true spiritual identities and be motivated with a spirit of helping one another meet the needs of our souls.